Tony’s 16-year confinement and ultimate death as a roadside attraction expose the failure of the American legal system. Tony should have been allowed to live in a sanctuary, where he could feel grass under his paws. For more than six years, the Animal Legal Defense Fund fought tirelessly to save a tiger named Tony from a cage in the parking lot of a Louisiana truck stop. Sadly, we received news this week that Tony had died of kidney failure after spending 16 years confined to his cage, living and dying as a roadside attraction. Tony’s plight is a microcosm of the problems with our legal system, a system that treats sentient beings as property and affords disproportionate political influence to their captors and abusers. Dr. Marc Bekoff, professor emeritus of Ecology and Evolutionary Biology at the University of Colorado, Boulder, concluded that Tony’s enclosure was completely unnatural and totally unfit, and that the manner in which Tony was kept at the Tiger Truck Stop fell significantly below the bare minimum required to ensure his psychological welfare. 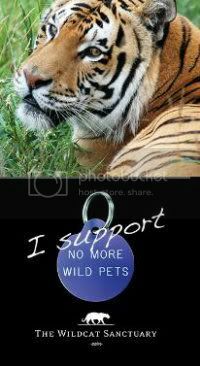 The state legislature and the Louisiana Department of Wildlife and Fisheries (LDWF) recognized that keeping wild animals in captivity causes immense animal suffering and threatens public safety, so they banned the private possession of tigers. 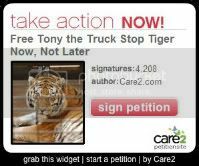 But the agency bowed to pressure from the Tiger Truck Stop and issued it a grandfather permit to keep Tony in spite of the ban. In early 2011—moved by Tony’s suffering and the passion of his supporters—we sued LDWF, arguing that the truck stop wasn’t eligible for a grandfather permit. And we won. The trial court ruled that because the truck stop violated a local ordinance prohibiting the ownership and exhibition of tigers, it couldn’t qualify for a permit. The court ordered LDWF to revoke the permit and prohibited it from issuing any new permits. The Louisiana Court of Appeal affirmed the trial court’s decision, leaving the Tiger Truck Stop and Michael Sandlin with an unlawfully possessed tiger and no permit to keep him. LDWF should have seized Tony and sent him to a sanctuary where he could have lived out the last six years with grass under his paws, fresh air in his lungs, and caretakers who prioritized his well-being. Instead, Tony would spend the next six years as a victim to a lethargic legal system that failed him at every turn, notwithstanding the indefatigable efforts of his legal advocates. At the root of the problem is the fact that in the United States, animals are property. And any time one asserts the rights of property against the rights of its owner, the game is rigged. Tony’s “owner,” Michael Sandlin, was able to exploit a narrative of private property rights under siege, claiming over and over again that he had a God-given right as an American to own a tiger. Sandlin even filed his own lawsuit, arguing that Louisiana’s ban on tigers violates his property rights. We intervened against Sandlin in the case to defend the ban and the right of the government to prohibit the inhumane captivity of wild animals. The case has been pending for more than five years. Although we expect Sandlin’s lawsuit to lose, as a delay-tactic to keep Tony trapped at the truck stop, it succeeded spectacularly. Another troublesome aspect of our legal system also doomed Tony to die at the truck stop: the undue influence of money in politics and the corruption of the political process by those who abuse animals. In 2014, Sandlin convinced his state senator, Rick Ward, to introduce a bill to exempt Tony—and only Tony—from the state ban on big cats. The bill carved out a retroactive exemption to place Sandlin above the law that applies to all other Louisiana citizens, co-opting the legislature to undo the legal victory that revoked the truck stop’s permit. Despite our on-the-ground efforts to stop the bill in Baton Rouge, it passed and was signed into law by then-governor Bobby Jindal. We challenged the new law as an unconstitutional “special law”—a giveaway to a private special interest at the expense of the public interest. But the lawsuit was bounced on a procedural technicality to a different court, then languished, awaiting a ruling from the court that didn’t come quickly enough to spare Tony. All told, we filed four lawsuits, intervened in a fifth lawsuit, and fought legislatively for Tony’s freedom. Tragically, it wasn’t enough to overcome the lethargy of the courts to act—and the corruption of Louisiana politics. 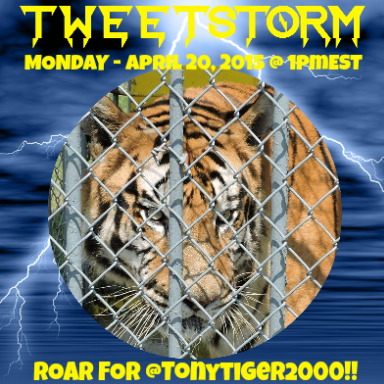 But we will hold our grief over Tony’s death in our hearts and our memories as we continue to fight to prevent Michael Sandlin and the Tiger Truck Stop from replacing Tony with another tiger, and as we fight for the liberation of other wild animals from cruel captivity. Stephen Wells is executive director of the Animal Legal Defense Fund. The Animal Legal Defense Fund is deeply saddened by the death of Tony, the Siberian-Bengal tiger held captive in the Tiger Truck Stop parking lot in Grosse Tete, Louisiana. For more than seven years, we litigated on many fronts to free Tony, and we are devastated that despite our best efforts, he lived and died caged at a truck stop that could never provide the life he deserved. We—like you—are frustrated and angered that Tony continued to suffer at the Truck Stop even after the Animal Legal Defense Fund successfully obtained a judgment in 2012 prohibiting Louisiana from issuing any future permits for Tony’s captivity. That judgment should have required the State of Louisiana to move Tony to a reputable sanctuary where he could have lived for the last five years in the naturalistic environment he deserved. Rather than giving Tony the life he deserved, however, the Louisiana legislature passed a law exempting the Tiger Truck Stop—and the Tiger Truck Stop alone—from the Louisiana Big Cat Ban, undoing our victory in court and trapping Tony at the truck stop. Despite our best efforts, we were unable to get that corrupt legislative maneuver declared unconstitutional in time to save Tony. But rest assured our litigation efforts on behalf Tony’s fellow big cats will not end. We will continue to fight with vigor to uphold the constitutionality of Louisiana’s Big Cat Ban against the challenges to that law from the Tiger Truck Stop’s owner, Michael Sandlin. A victory in this litigation will ensure that Tony will be the last tiger to suffer at the Truck Stop and there will never be a Tony II or Tony III who will have to suffer the same fate. While we are saddened that we were unable to save Tony from his tragic confinement so that he could join other Animal Legal Defense Fund clients like Rickey the Bear, Njjarra the Lion, and Bear the Wolf at reputable sanctuaries—we will continue to fight in the memory of Tony and the millions of other animals who have been mistreated, until no more animals are subject to such suffering. BATON ROUGE, La. – The Animal Legal Defense Fund has filed an administrative appeal, urging the United States Department of Agriculture to recognize a captive tiger as an “individual” whose physical safety is at risk and to expedite the group’s public records request. The Animal Legal Defense Fund is seeking records under the Freedom of Information Act (FOIA) related to the health and well-being of Tony the Tiger, who has been confined at the Tiger Truck Stop in Grosse Tete for 16 years. The Animal Legal Defense Fund sought expedited processing, which FOIA requires when delayed disclosure “could reasonably be expected to pose an imminent threat to the life or physical safety of an individual,” namely Tony the tiger. The USDA erroneously denied the Animal Legal Defense Fund’s request, asserting that Tony is not an “individual” because the term applies only to humans. BATON ROUGE, La. – The Animal Legal Defense Fund has filed a motion for summary judgment that would at long last resolve the years-long legal battle over the fate of Tony, the 16-year-old tiger held in a cage at the Tiger Truck Stop in Grosse Tete. 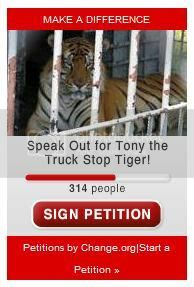 Tony has attracted the attention of animal lovers nationwide for the impoverished conditions of his captivity and the lengths to which Tiger Truck Stop has gone to continue profiting off the tiger’s misery. A lawsuit, filed by Tiger Truck Stop owner Michael Sandlin in 2012, argues that Louisiana’s 2006 ban on private ownership of big cats is unconstitutional. Sandlin has been able to maintain captivity of Tony despite the ban because he has challenged the constitutionality of the big cat ban and also successfully lobbied Louisiana to pass Act 697, a law exempting Sandlin – and only Sandlin – from the big cat ban. Sandlin’s lawsuit is intended to allow Sandlin to buy and exploit another tiger after Tony dies. The Animal Legal Defense Fund’s motion for summary judgment challenges both of these legal tactics employed by Sandlin to keep Tony at the truck stop. The motion demonstrates Louisiana’s common sense ban on private possession of big cats was an appropriate and constitutional exercise of the state’s authority. The motion also demonstrates the “special law” exempting Sandlin from the big cat ban was unconstitutional. If the court agrees with the Animal Legal Defense Fund and upholds the ban while striking down the exemption, Sandlin’s possession of Tony will again be illegal and the Department of Wildlife and Fisheries will have a duty to intervene on Tony’s behalf. The Animal Legal Defense Fund thanks the law firms Jones Walker, Proskauer Rose, and Baker Donelson for providing pro bono representation in the case. 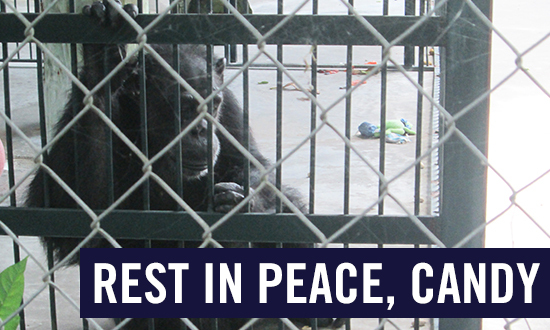 On Friday afternoon, the Animal Legal Defense Fund received devastating news; Candy the chimpanzee had died. To hear of any animal’s death is heartbreaking, but losing Candy was especially difficult. For decades, Candy was held captive at Dixie Landin’ amusement park in Baton Rouge, Louisiana in lonely, cramped captivity and without any interaction with other chimps. Her isolation was torture. In November 2015 we filed a lawsuit against Sam Haynes and the Dixie Landin’ amusement park under the Endangered Species Act (ESA) for inhumanely confining Candy in isolation and neglecting her welfare. We also made multiple offers to transfer her to a sanctuary capable of meeting the needs of such a complex, intelligent, social creature. It is a tragedy that Candy spent her final days in such conditions. I’m writing to tell you about this today because I want you to know that we will never stop fighting for animals like Candy. Everyone here at the Animal Legal Defense Fund is heartbroken over Candy, but this terrible loss highlights the urgency of similar cases of animals in captivity. For six years we have had litigation pending to release Tony, a 16-year-old tiger in potentially declining health held captive at a truck stop less than an hour away from where Candy was held. I assure you that we will continue fighting for Tony, in Candy’s honor. I wish I never had to write to you with such sad news, but it’s important to us at the Animal Legal Defense Fund that everyone knows we will never forget Candy, and we will never stop working to save animals like her and Tony. Thank you for your tireless effort to help us release Candy from her barren cage. May she rest in peace now.